The accessory provides "optimal charging performance" with the MacBook, which has a built-in USB-C port, Apple says. It also enables fast charging for the iPhone 8, 8 Plus, and X, as well as 10.5- and 12.9-inch iPad Pros. All 9.7-inch iPads are excluded. The adapter doesn't come with a cable of its own, meaning buyers will have to repurpose existing cables or buy new ones. iPhone and iPad owners will likely have to buy USB-C-to-Lightning cables, since even the iPhone X comes with USB-A-to-Lightning. Some iPhone owners have complained about Apple's decision to support fast charging but continue including basic 5-watt adapters by default, presumably because it would've cost more in both parts and packaging to include something powerful. Apple has been rumored as upgrading to an 18-watt USB-C wall charger for this fall's iPhones. While it can take as long as two and a half hours to charge an iPhone 8 Plus with a 5-watt adapter, using a 29-watt adapter can cut that time down by an hour. The 30-watt adapter costs $49. As of this writing, online orders can be delivered as soon as Thursday, and the accessory should be available at retail outlets by the end of the week. I guess we now have a definative answer to whether or not the new iPad (2018) supports fast charging. What I wonder is if fast charging reduces the life of the battery. Electric cars that also rely on lithium batteries see a significant drop in battery longevity if always choosing rapid chargers. I realize the voltage and wattages are dramatically higher in that case, but the battery packs in these cars are still made up of hundreds of small battery cells. Roll the clock forward a few years and there may be complaints from phone owners that had higher wattage chargers instead of the 5 watt model. Perhaps the convenience of fast charging is worth replacing the phone battery more often? Does dramatically higher charging wattage increase the risk of a sudden battery failure? An enemy of batteries is heat. I expect that phones on high wattage chargers have a much warmer battery when charging. Generally charge overnight, so one hour or 2-1/2 hours doesn't make much difference to me. Did I miss a mention of the AirPower matt, or did that just get completely glossed over? "iPhone and iPad owners will likely have to buy USB-C-to-Lightning cables, since even the iPhone X comes with USB-A-to-Lightning." As of this moment, Apple has not said a word about AirPower at WWDC. Does this fast charging wear out the iPhone battery faster? I used to use my 12w iPad charger on my old iP6+ and while it was great that it fully charged in a little over an hour, I think it contributed to the battery barely holding a charge after six months of use. 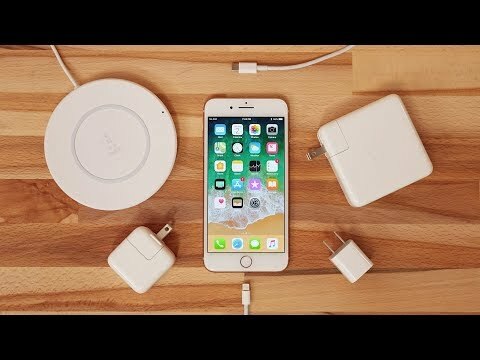 Fast charging really isn't worth the money. It's only faster under 50% and then it's the same speed as the 12W charger. I always charge @12W and my 7 Plus was still at 100% battery health more than a year after launch day when I sold it. I try and stay between 40-80% for the most part, never let it get below 20%, and don't leave it on the charger once it reaches 100%. Avoiding heat/cold helps too. The 12W iPad charger is a far better value for iPhones. So it's normal for my iPad Pro to take all day to recharge?